The third and main migration began Tuesday, April 20, 1734, when the first family left Berthelsdorf, Germany. The emigrants embarked on the Elbe River for Altona, Denmark, on April 28, and on May 20 reached their destination. On June 21 they embarked on the ship Saint Andrew, and on July 29, Plymouth, England, was reached. They first saw land of the New World on September 17, and on September 22 the actual landing in Philadelphia took place. Palatines imported in the Ship, Saint Andrew, John Stedman, Master, from Rotterdam, Netherlands, but last from Plymouth, England, as per Clearance thence. Qualified Sept. 12, 1734 [Old Style] at Philadelphia, PA. The spelling in this Stedman’s True List is a marked departure from the original – Wiegner, Hübner, Kriebel, Jäckel, Hoveman, Reynald, Weys, and Meyster. Apparently the clerk, who seemingly was unfamiliar with Germanic orthography, wrote the names phonetically as they were dictated by Captain Stedman. 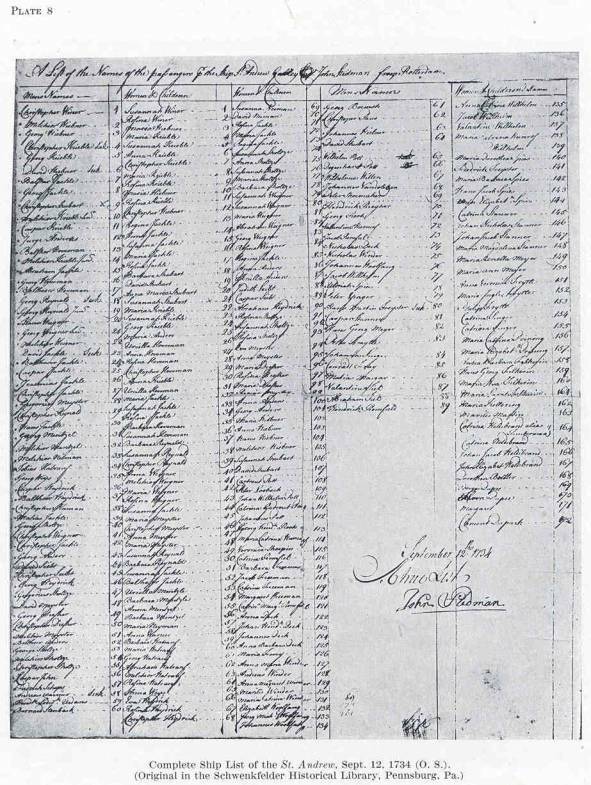 The names of Eva Heydrick [F 51], Maria Yeakel [F 68], Abraham Yeakel [F 208], George Yeakel [E 209], immigrants, do not appear in the Stedman list, and are, therefore, placed last in the list as possibly being open to question. In this list, the spelling of Stedman’s True List are followed. E 17 F 17 Hiebner, Melchior Melchior Hübner/Heebner, M.D. ~1668 UNK 1738 HGH? E 38 F 38 Jackle, David (sick) David Jäckel/Yeakel ~1659 UNK UNK MCP? E 49 F 49 Hatranf, Tobias Tobias Herterranft/Hartranft ~1684 1717 1758 SPL? E 133 Single Warmer, Anna UNK UNM 1750 MCP? E 142 F 52a Heydrick, Rosina Rosina (Hübner/Heebner) UNK UNK 1738 HGH? E 143 F 52a Heydrick, Christopher Christoph Heydrick 1731 UNK 1756 SSC or TSC? HCP Hood Cemetery (originally known as Lower Burial Ground of Germantown), 4900 Germantown Ave. & Logan St., Germantown, PA. This site is a wonderful resource. My family is descended from Christopher Schultz and it’s great to have a “readable” list of the passengers on the St. Andrew, who were on the ship with Christopher. I took a quick look and I see names that I came across when working with Ancestory. I will get my info to you soon. Thanks so much. What information are you looking for with Lindsay Kriebel family. I have where some of them were married, died, etc. I have very little info on Linsay Kriebel I want to finish the Jacob family. I will share the info I have on the rest of the family. My line in America starts with Susannah Scholtze I have cd with all schwenkfelder families, and the dates of birth, marriage, children, deaths all the way to 1920’s. more than 1,800 pages. I bought it on ebay. if you can’t find it please let me know and I can make one for you. It is about 1800 pages filled with every birth marriage, death. along with journal and communications. That’s great I’ve never seen anything like that. Of course I’m never on ebay. Is this something they have on an ebay store or just an individual who was selling them? Sandy, contact me at midnight2u2002@msn.com and I can send one to you.